While most of the time when we see videos and articles on robberies we see someone running off with lots of money or merchandise, right? Well, not this time. Just a few weeks ago a man tried to rob an E-cig store and failed, big time. This happened several weeks ago in Aurora, Colorado and caught a lot of people off guard. The Aurora Police Department actually posted the surveillance footage of the robbery on their Facebook page and many have been laughing hysterically about the man’s pitiful attempt. While there is a lot of danger behind this situation and there is nothing funny about a robbery attempt, the man doing the ‘robbing’ sure does seem like an idiot. I guess you could easily call him one of the world’s most pitiful criminals. While the gun was not real and was a mere replica handgun (a BB gun that had the orange tip removed) it is still a very serious crime. Once he loses his ‘gun’ the robber seems to think for a split second that he should still continue on but quickly changes his mind. He is out the door as quickly as he came in and as far as we know has not been apprehended yet. We are asking for your help in identifying the man in this video who attempted to rob the E-Cig of Denver located at 2222 S. Havana St. on Sunday. This would be robber attempted to pull a replica handgun from his pants but sends it flying over the counter instead. The BB gun, with the orange tip removed, fell onto the floor where the clerk grabs it. The suspect quickly changes his mind and runs out of the business, fortunately leaving no one injured. 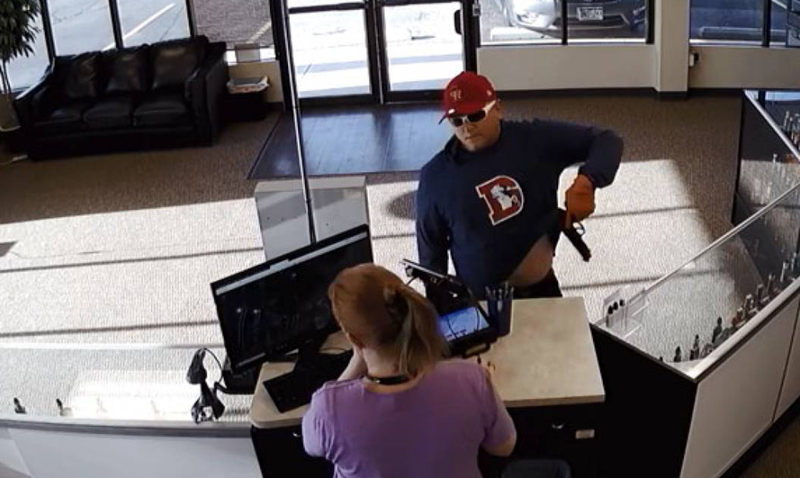 The suspect is a white male who was wearing a red hat, a blue Denver Broncos sweatshirt with an orange “D” on the front, black pants, sunglasses, orange gloves, and white shoes. Anyone with information on this case is asked to call Detective Hefty at 303.739.6947 or tipsters can call Metro Denver Crime Stoppers at 720.913.7867. By using Crime Stoppers, tipsters can remain anonymous and be eligible for a reward of up to $2,000. Feel free to check out the video of the whole ordeal for yourself below. What do you think? Will the man end up being tracked down or will he get off Scot-free having somehow made it away? I for one truly hope his actions catch up to him. When it comes to doing things like this you are risking so much more than you are gaining. Trying to rob a store or anyone in general with a real gun or a fake gun is something that changes a person’s life forever. Things like this cannot just be undone even though as you can tell in the video the robber most likely wishes he could go back in time.